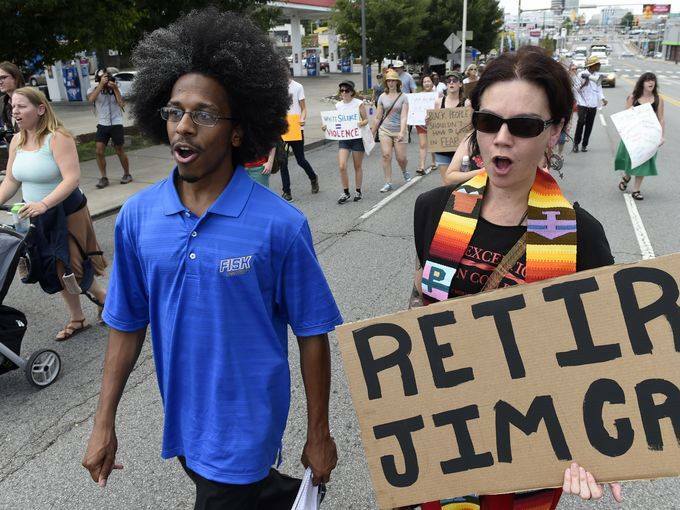 On Saturday, July 18, many SURJ folks turned out for the March Against Fear, Nashville’s contribution to the Week of Righteous Resistance (WORR). 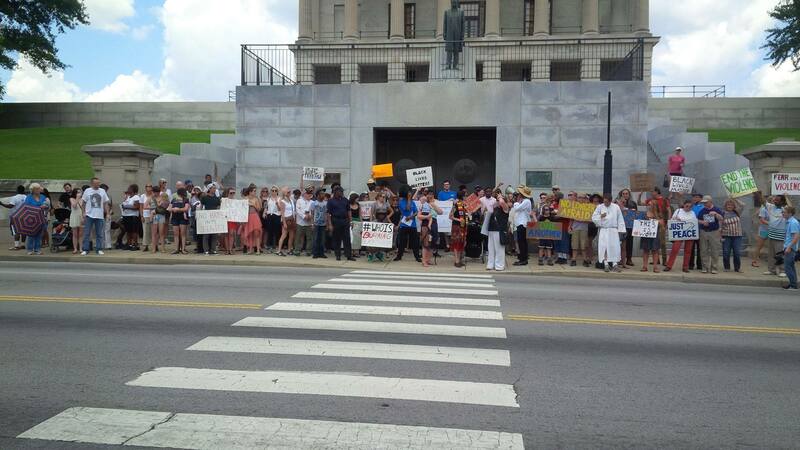 People across the country participated in counter-rallies to respond to the KKK rally planned in South Carolina. A coalition of students, clergy, and community organizations from across the state marched from the historic Greater Bethel AME Church to the Tennessee State Capitol. Please direct resources to rebuilding black churches. Click here to donate. Read the Liturgy for Generosity and Charity for Black Churches Arsons. Read more about WORR here: http://thisisworr.org. March Against Fear will still be held Saturday, July 18at 11:00am – 3:00pm but the new location is now the Greater Bethel AME Nashville 1300 South St, Nashville. The March Against Fear will still be going forward. However, because of local policies in Pulaski preventing us from obtaining a permit to march and residents very real concerns/ fears regarding the repercussions of our actions when we all leave, the march will now be taking place in Nashville. Our message will be the same as we march to the Tennessee State Capitol– on the same day the KKK will be holding their rally at the Capitol in SC– in solidarity with the residents of Charleston one month after the tragic attack, and to challenge our state’s own regressive policies, deeply rooted in racism and fear that deny healthcare, voting rights, living wage jobs, and fairness in the criminal justice system. In addition, we will continue to work with the community in Pulaski on actions to address the violence of both racism and poverty that affect the area beginning with a community forum, providing a safe space for residents to begin telling the truth of their experiences. On July 18, 2015, a coalition of students, clergy, and community organizations from across the state invite all who seek racial equality, social justice and peace to march 14 miles from Minor Hill, TN to Pulaski, TN in an effort to grow a moral movement for positive social change. This march will be in solemn commemoration of the victims of the Emanuel AME massacre in Charleston, SC, and embarked upon because we believe it’s time to move forward together in the spirit of unwavering hope and love that will dispel the hatred that’s forever changed those families and many throughout the country. In the tradition of the March Against Fear from Memphis to Jackson in 1966 — a major civil rights demonstration launched by James Meredith to counter racism that followed the passage of federal civil rights legislation — we’ll join together to challenge the fear that is at the base of all white supremacy. We’ll call for an end to the Jim Crow culture of intimidation existing in the formal displays of historically racist symbols and iconography such as the Confederate battle flag, but also in the fundamentally racist policies that suppress voter rights, access to healthcare, quality education and living wages. We have chosen the route from Minor Hill to Pulaski based on data from the Southern Poverty Law Center that indicates that Tennessee has 29 active hate groups — more than any of our surrounding states. In February, a Tennessee man and member of a Klan-affiliated church was fined and sentenced to jail for burning a cross in an interracial couple’s yard in Minor Hill. Just 12 miles away, the small town of Pulaski is known as the 1865 founding site of the KKK and a historical epicenter of white supremacy. Though residents have actively challenged such groups since 1989 when Pulaski closed its businesses to protest a march by white supremacists, every October the town is violated by the Ku Klux Klan’s “Heritage Festival” where racist skinheads, neo-Nazis and klansmen have gathered for decades. The Knights and their families march up and down the street with KKK flags, selling racist tracts, pins and Klan robe patches. We recognize this as proof that our racist history isn’t just back to haunt us. It never left. We know we live in a country where racist violence exists—unabated and unreconstructed—both in symbol and in policy. We are not distant from the crimes, inhumanities and hatred of the past; and therefore, we seek to meet these wrongs where they are and eliminate them for good through an ever-more-powerful sense of unity and love. It is for this purpose that we ask all concerned peoples to walk with us from Minor Hill to Pulaski on July 18 and call for an end to fear and hate. Join as we March Against Fear on July 18. Together we can resolve racial, social, economic, and political conflict, and finally build the beloved community that Rev. Dr. Martin Luther King Jr. dreamed of.